“I feel like a lot of what we’re doing for clients and why it’s resonating so well for us even at an early stage is that we’re taking the oldest sales management trick in the book, which is the sales contest, and adding some technology and innovation to it. So, it’s not a new concept. Salespeople are competitive, they like to know how they stand relative to their peers, and it creates some energy…creates some excitement within the team. There’s just technology that enables it to happen in a more interesting way. Bob goes on to discuss how he understands why people look at gamification as something new. Hearing terms like “levels” and “badges” and “virtual currency” can make it all a little confusing. 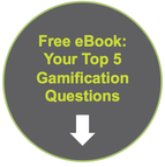 But when you break down the concept of gamification, it’s really quite simple. So is the fact that it can create significant business results. Check out the full discussion between Adam Metz and Bob Marsh here. You’ll learn about how companies use gamification, whether it works for older generations and how certain gamification solutions compare! Sales gamification -- it's actually all about one of the oldest tricks in the book.